July 9-15, 2017 - Another Great Success! Special Grover/Tafoya Signature Timpani Mallet SPECIAL at Steve Weiss Music! IU Jacobs School of Music Percussion Department's "Opening Night!" 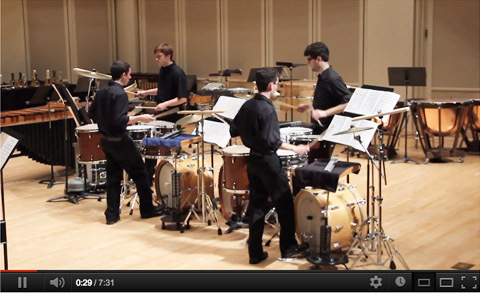 Check out a performance of the IU Percussion Ensemble (click on the above photo). 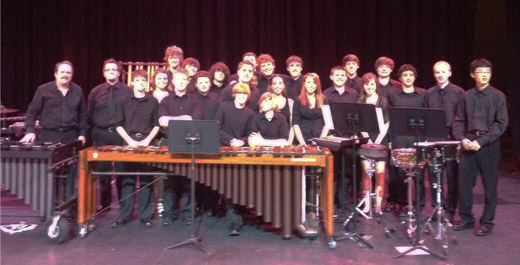 I had a great time working with the percussion students at Penn High School in Mishawaka, Indiana on March 14 and 15. On March 15 we performed "Colossus" by Eric Rodis. Special thanks to Glenn Northern, Bill Leather, and Jeff Perry. I had the pleasure of performing with the Baltimore Symphony Orchestra during the week of January 16 - playing Ravel: Bolero, Tchaikovsky: Piano Concerto, and Strauss: Also Sprach Zarathustra under the direction of Marin Alsop. Special thanks to Derek, John, and Brian (pictured above) -- I had a great time! Many thanks to ALL OF YOU who attended my clinic at PASIC! 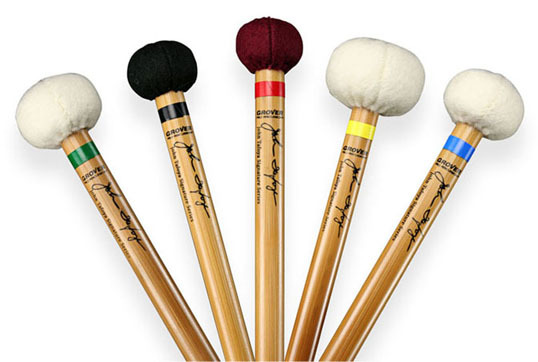 NEW Tafoya Timpani Signature Timpani Mallets Available through Grover Pro Percussion! ON SALE via the Grover Pro Percussion Website. Be sure to visit the Grover Pro Percussion Facebook site HERE. And BE SURE to CHECK THESE MALLETS out at PASIC! These mallets have been designed to deliver a clear sound over a huge dynamic range. The bamboo is excellent and each mallet contains a rounded wood core. A terrific mallet and PERFECT for auditions! AND IF that isn't ENOUGH . . .(!) A NEW BOOK! Check it Out!! 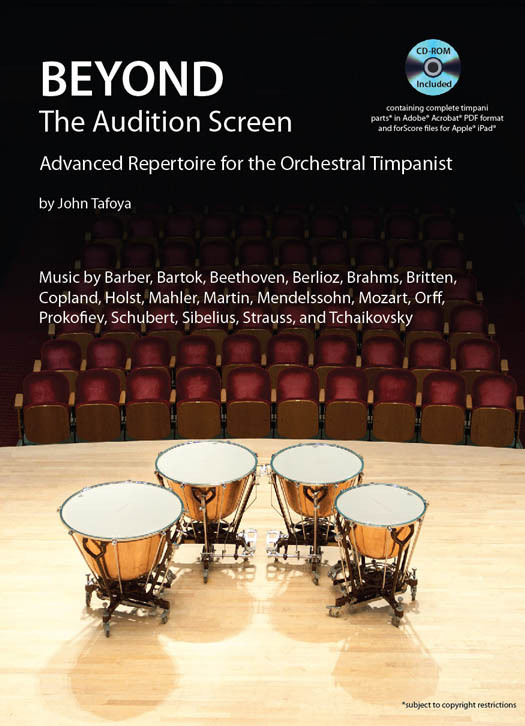 BEYOND The Audition Screen features 27 orchestral works currently requested at timpani auditions. The included CD-ROM contains the entire timpani parts (subject to copyright restrictions) in Adobe® Acrobat® PDF format for further study along with annotated forScore files for the Apple® iPad®. Each page includes important items to consider in preparing each orchestral work. These observations are taken from John Tafoya's personal experience with orchestral timpani auditions and from his professional experiences in rehearsals and performances with world-renown conductors. The reader will also enjoy a variety of musical and technical options presented in this book. 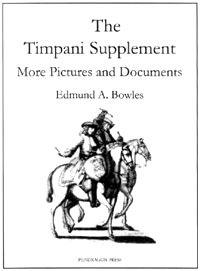 Options include: edited dynamics, stickings, timpani mallet recommendations, illustrations, exercises, errata, extra notes, tempos, and an interesting section on timpani maintenance by Marshal E. Light, owner and manager of the American Drum Manufacturing Company. "Expert advice from a true master. All of the information that John Tafoya has compiled, from the interpretation ideas to timpani maintenance, makes this a fantastic resource for the percussion community." "I find this book to be an excellent source for elevating one's musical awareness in performing the repertoire, which is the key to playing timpani." I had the pleasure of working with the super talented musicians of the National Orchestral Institute this week. They were featured in a terrific performance on Friday night, performing Brostrom: Twilight and Hall: Escape Velocity. Saturday night they will be performing Rudiger Pawassar's "Sculpture in Wood". 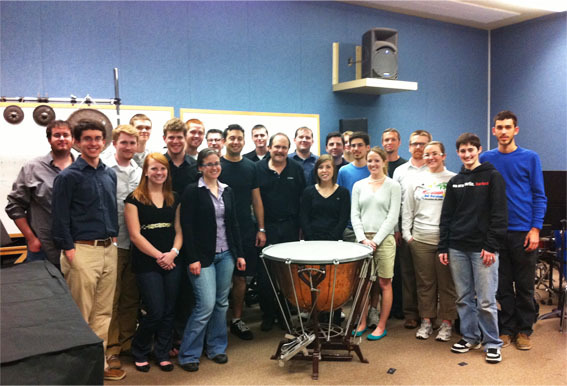 The IU Percussion Ensemble had a terrific concert season this year. Please check them out (click on the above photo). I had a terrific experience working with the percussion students at FSU in Tallahassee, Florida this past week. BRAVO to Professor John Parks and the percussion studio at FSU! My visit began with a rather crazy masterclass on Sunday evening (after I had been on the road for 7 hours) followed by lessons, a special Seminar (with awesome brownies) and a class in which we went through the process of putting on a new timpani head. Special thanks to Matt Jordan - I still owe you some money for meals . . . Check out the LATEST Zildjian Score Online Magazine Videos! I had a terrific time in Tennessee - visiting the Blair School of Music (Vanderbilt University), UTM, and the University of Evansville. Special thanks to Mr. Bill Wiggins (Blair), Julie Hill (UTM), and Bill Shaltis (UE)! Houghton and Tafoya BURN IT UP on Santorini! Steve Houghton and John Tafoya premiered "Santorini"- a duet for drum set and timpani by Steve Houghton. This piece was part of the IU Summer Percussion Academy/Workshop's Faculty Recital which took place Monday, July 19 in Auer Hall. Other performers included Kevin Bobo, John Kilkenny, Michael Spiro, and the Steve Houghton Jazz Trio. The IU Summer Percussion Academy/Workshop got off to a GREAT START this evening with "The World of Percussion" concert - featuring our counselors and staff performing solos and duets. The second half of the program featured Michael Spiro showcasing our Steel Pan, Afro-Cuban and Brazilian Ensembles. The IU Summer Percussion Academy/Workshop faculty will be featured in a recital tomorrow (Monday, 7/19) evening at 7 pm in Auer Hall. The National Orchestral Institute began its Chamber Music Week on May 31 which included 2 percussion chamber performances (Hollinden: The Whole Toy Laid Down and Hollo: Jose Before John 5 on Saturday, June 5 as well as Burritt: Doomsday Machine and Fitkin: Hook on Sunday June 6) at the Clarice Performing Arts Center on the campus of the University of Maryland's School of Music. The NOI Percussionists were AWESOME this year! Performing the above repertoire at an incredibly high level! (bottom row left to right): Karli, Katy, and Yours Truly]. Thanks for a TERRIFIC Week!! I had the opportunity to perform as principal timpanist for the Arizona MusicFest Orchestra (Scottsdale, AZ) during the week of February 21st. The orchestra, under the direction of Robert Moody, performed 4 concerts (12 services!) and included orchestral musicians from major symphony orchestras. Timpani enthusiasts will WANT to pick up this book - which includes a few photos of my instruments as well! Order it HERE on Amazon.com. Be sure to check out David Patterson's work, "Beaver Moon" -- taken from a recent recording session with Native American Flutist James Pellerite. 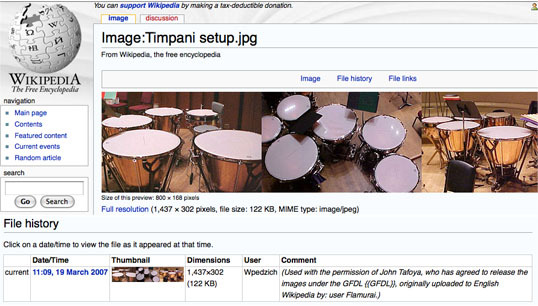 Click HERE to view the Wikipedia Timpani webpage. This valuable collection of quick-to-read yet deeply insightful strategies is like finding expert trade secrets all placed in one easy, quick-to-read source. Contributors to the book were even eager to get a look at each other's ideas! 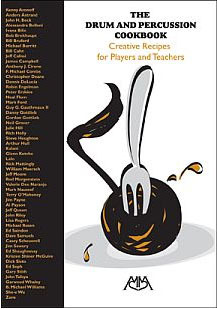 With outstanding records of performance, workshop clinics, recordings, research, composition, leadership, and teaching, the 57 authors provide their favorite "recipes" that cover an extreme range of topics from rudiments to rock, drum set to symphonic playing and keyboard percussion to interpretation. Contributing authors include: Kenny Aronoff, Anders Astrand, John H. Beck, Michael Burritt, Bill Cahn, James Campbell, Anthony Cirone, Christopher Deane, Robin Engelman, Peter Erskine, Mark Ford, Danny Gottlieb, Gordon Gottlieb, Neil Grover, Rich Holly, Steve Houghton, Glenn Kotche, William Moersch, Jeff Moore, Al Payson, Michael Rosen, Ed Saindon, Dave Samuels, Ed Shaughnessy, Ed Soph, John Tafoya, Garwood Whaley, She-e Wu, and MANY OTHERS!!! For more information go to: http://www.meredithmusic.com/ and click on "What's New!" A few people have Emailed me recently inquiring about teflon tape - primarly where to purchase it. The teflon tape used on the lip of timpani bowls (to act as a lubricant between the bowl lip and the head) is not the same kind of teflon tape you'll find at your local hardware store. Indiana University Jacobs School of Music percussion students had a terrific time at PASIC (held in Indianapolis) this year. There was a significant "IU Presence", with several students earning awards. Christopher Latournes was named Winner of the PASIC Orchestral Percussion Mock Audition. The judges included professional musicians from the Boston Symphony Orchestra, Philadelphia Orchestra, Kansas City Symphony, and U.S. "President's Own" Marine Band. Nick Taylor was awarded First Place in the PASIC Marching Festival Individual Competition, Collegiate Snare Drum Category, after performing a unique and awe-inspiring solo. Separate from the specific awards, the IU Drumline, under the direction of Joel Brainard, performed in the College Standstill Exhibition as part of the Marching Percussion Festival at PASIC. Although this was an exhibition, the drumline was adjudicated by the nation's most reputable marching percussion teachers and arrangers. The audience cheered as the IU Drumline loosened up the crowd, and demonstrated how much fun it can be to perform in a college drumline. 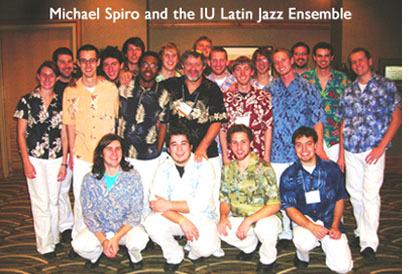 Finally, the Indiana University Latin Jazz Ensemble under the direction of Michael Spiro was featured in a special performance for the Hall of Fame Celebration, and had the entire crowd of distinguished guests and artists on their feet, applauding their stellar performance. BRAVO to all the wonderful efforts of the IU percussion students! Equally inspiring was the leadership of Steve Houghton, President of PAS. He worked on the planning of PASIC for the last year, developed the incredible PAS museum, was involved in the Ribbon cutting for the Grand Opening of Rhythm! Discovery Center, and was a keynote speaker on behalf of PAS. He presided over 2 PAS Board of Directors meetings; presenting budgets and bylaw changes. Steve also attended countless meetings with PAS committees and chapters, met with a number of artists invited to perform at PASIC, and presided over the PAS awards ceremony at the Thursday evening concert. Steve also presided over the Hall Of Fame Celebration and announced the awards at the Friday evening concert. He met regularly with Industry folks throughout the conference and welcomed the audience to the Saturday evening concert. Bravo (and thanks!) to Steve Houghton! 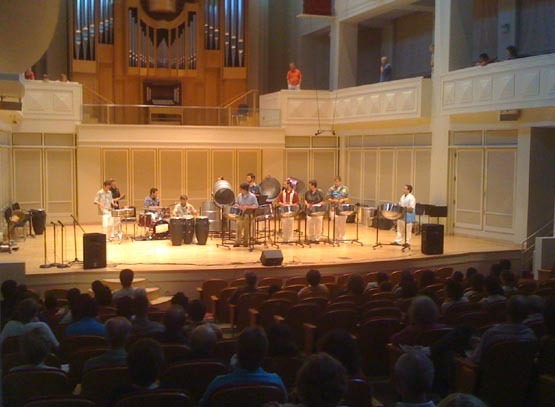 Please be sure to check out the "News and Events" section of the IU Jacobs School of Music Department Website at: http://www.music.indiana.edu/department/percussion/news.shtml. Those of you who want to look back at some previous PASICs - click HERE. Special thanks to all of our summer percussion academy/workshop faculty: Kevin Bobo, Christopher Deviney, Steve Houghton, John Kilkenny, Stanton Moore, Michael Spiro, Leigh Howard Stevens, and John Tafoya. 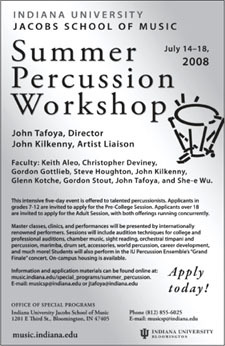 Information on the 2010 IU Summer Percussion Academy/Workshop will be posted within the next month or so at: http://www.music.indiana.edu/special_programs/summer_percussion or email John Tafoya at johntafoya@aol.com for more information. Another great chamber music week with some incredibly talented percussionists at the National Orchestral Institute in College Park, Maryland. During this past week the NOI percussion section rehearsed and performed Dave Hollinden's "The Whole Toy Laid Down", Bruce Hamilton's "Raptures of Undream", Nigel Westlake's "Omphalo Centric Lecture", and Part 2 of Daniel Levitan's Marimba Quartet. They will also perform "Ogoun Badagris" by Christopher Rouse later in the festival. For more information on upcoming NOI performances please check out: http://www.music.umd.edu/special_programs/national_orchestral_institute/. From February 23 - March 1, 2009 I had the good fortune to be part of the 2009 Arizona MusicFest held in Scottsdale, Arizona (Robert Moody, Music Director). The final week of this impressive winter music festival included 4 orchestra concerts (Brahms: Symphony No. 1, Beethoven: Symphony No. 3, Vaughan Williams: Dona Nobis Pacem, Dvorak: Cello Concerto with Lynn Harrell). During the week I also had the opportunity to work with the very talented students at Arizona State University (Prof. J.B. Smith, host) and the University of Arizona in Tuscon, AZ (Prof. Norman Weinberg, host). More Rave Reviews for the IU Percussion Ensemble! The IU Percussion Ensemble received another favorable review in the Bloomington Herald newspaper today. Click HERE to read the review. Check out the latest WFIU interview leading up to the final IU Festival Orchestra Concert. The IU Summer Percussion Academy/Workshop was a Terrific Success! This intensive 5 day workshop featured international renowned artists including: Keith Aleo, Christopher Deviney, Gordon Gottlieb, Steve Houghton, John Kilkenny, Glenn Kotche, Gordon Stout, John Tafoya, and She-e Wu. Click HERE to visit our official IU Summer Percussion Website. To view a larger version of our flyer, click HERE. 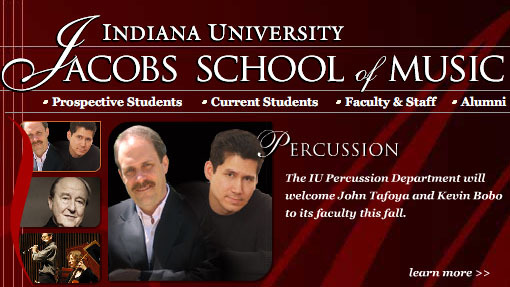 The official website for the IU 2008 Summer Percussion Academy and Workshop (and future summer offerings) can be found by clicking HERE or Email John Tafoya at: jtafoya@indiana.edu for additional information. Keep checking out the IU Percussion Department website for our latest activities and for future summer offerings! ALSO: A BIG THANK YOU to all of our Academy/Workshop counselors and volunteers: Will Reno, Ross Erickson, Josh Bowman, Kirk Etheridge, Claire Walker, Christopher Latournes, Mary McCauley, Dan Morris, Nick Stone, Tim Crockett, Greg Mueller, David Spencer, Brian Gardiner and the entire IU percussion department! I had the fortunate privilege to work with the talented percussionists at the National Orchestral Institute (at the University of Maryland) during the first week of June. The first week of NOI includes chamber repertoire - and we covered a substantial amount of works including: Chavez/Toccata, Hetrick/Tip of the Andes, Deane/Vespertine Formations, Westlake/Omphalo Centric Lecture, Levitan/Marimba Quartet, and Burritt/Doomsday Machine. I was also involved in a faculty recital performance of Stravinsky's l'histoire du soldat. I had a terrific time working with the talented students at Northwestern University on Monday, March 10. Special thanks to hosts Professor Michael Burritt and James Ross. Thank you also to Avedis Zildjian, Grover Pro Percussion, and Remo Inc.
Congratulations to David Constantine, Josh Frans, and Jake Harpster! Read the February 4, 2008 article featuring David Constantine online at: http://www.idsnews.com/news/story.aspx?id=48673&comview=1. On Sunday, November 25, funeral services were held in Bloomington, Indiana to celebrate the life and accomplishments of George Gaber. 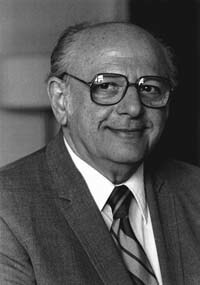 Distinguished Professor of Music at Indiana University from 1960-1986, Mr. Gaber revolutionized percussion education. Many of his students enjoy successful careers as performers and educators all over the world. Click here to read the obituary from the Bloomington Herald Times. 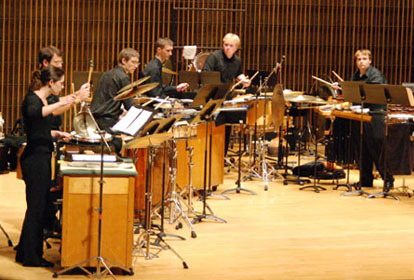 IU Percussion Ensemble receives rave reviews! The IU Percussion Ensemble performed two terrific concerts this semester (October 29 and November 12). The November 12 concert was reviewed in the Bloomington Herald Times. 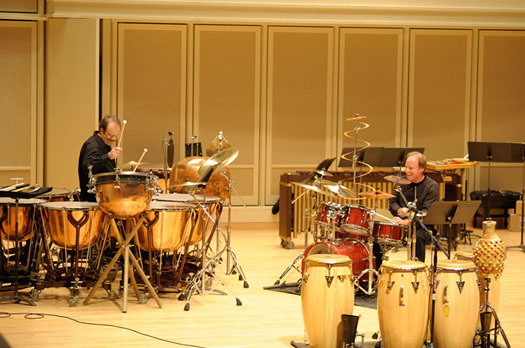 Check out the IU Percussion Department's website for the latest IU percussion news. Click HERE to visit the IU Percussion Ensemble's website. 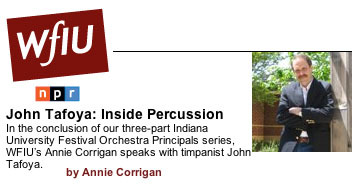 Be sure to check out the new information at the IU Percussion Website. We are currently updating this area, which will eventually include a podcast of our "opening night" faculty performances and general meeting with our (over 60!) percussion majors! 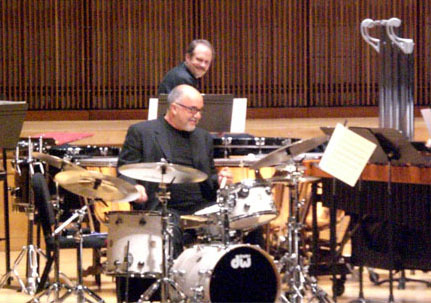 Peter Erskine's new work; "A Bird Sings" (dedicated to the memory of John Wyre) was premiered during the 2007 University of Maryland Summer Percussion Workshop. This work was performed by workshop artist faculty: Alan Abel, Christopher Deviney, John Kilkenny, James Swarts, John Tafoya, and She-e Wu. Another Successful Summer Percussion Workshop! 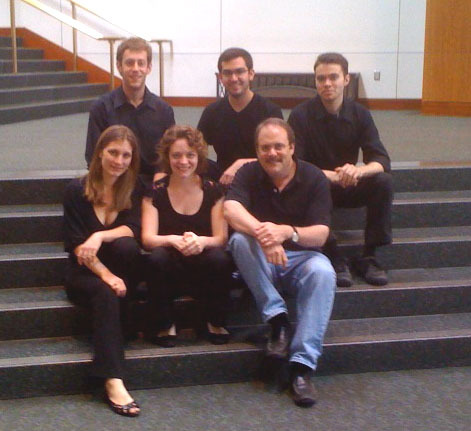 Artist faculty for this summer (July 2007) included: Alan Abel, Aubrey Adams, Keith Aleo, F. Anthony Ames, Fred Begun, Christopher Deviney, Peter Erskine, John Kilkenny, John Tafoya, Tom Teasley, She-e Wu, and the Talujon Percussion Quartet. Paul Yancich participated in a special internet videoconferencing session. In addition to a variety of masterclasses, clinics, and performances the UM Summer Percussion Workshop faculty presented the world premier performance of a new work for percussion ensemble by Peter Erskine; "A Bird Sings", dedicated to the memory of Mr. John Wyre. Read this interesting article on Rick Holmes from Playbill at: http://www.playbillarts.com/features/article/6222.html. Peter Kates, (pictured on right) principal percussionist with the Bergen Philharmonic Orchestra and professor of percussion at the Grieg Academy of Music, and I used Apple's iChat software to experiment with a "virtual masterclass"; playing xylophone and snare drum over the internet. This kind of video conferencing will take place throughout the semester between the very talented percussionists at the Grieg Academy and the University of Maryland. We will also use this technology to "videochat" with John Beck, David Herbert, Shawn Pelton, and Paul Yancich during the 3rd Annual University of Maryland Summer Percussion Workshop (July 22-28, 2007). The American Wind Symphony Orchestra, under the direction of Robert Austin Boudreau, just released a new CD entitled; "Concertos All And Sundry" featuring John Tafoya performing Kaoru Wada's "Three Fragments; Concertante for Timpani, Percussion and Wind Symphony" with the University of Maryland Wind Ensemble under the direction of Robert Austin Boudreau. Over 800 people checked out my clinic at PASIC on Friday, November 12th. The topic: "Plan B"; Unusual Techniques for the orchestral timpanist to accommodate extraordinary requests from the podium. The "timp-cam" was used again; giving the audience a top view of my instruments on television monitors. The tone of the clinic reached comical proportions as various scenarios were introduced (playing an incredibly soft roll, how to play very fast passages, shaping rolls, experimenting with single and double stickings, drum set up, pitch assignments, muffling, and specialty mallets). Special thanks to: American Drum Manufacturing Co., Grover Pro Percussion, Remo Inc., and the officers of PAS. Special thanks to Bruce Davies for these GREAT PHOTOS! 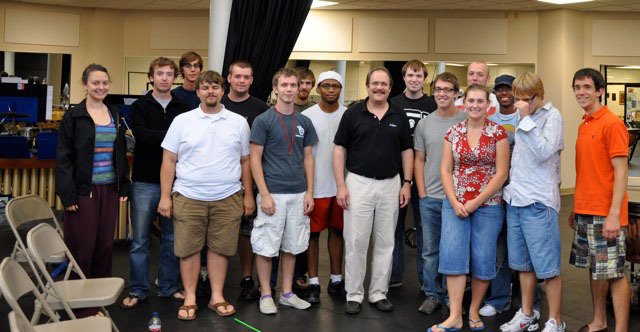 Check out Vic Firth's coverage of the UM Summer Percussion Workshop HERE. 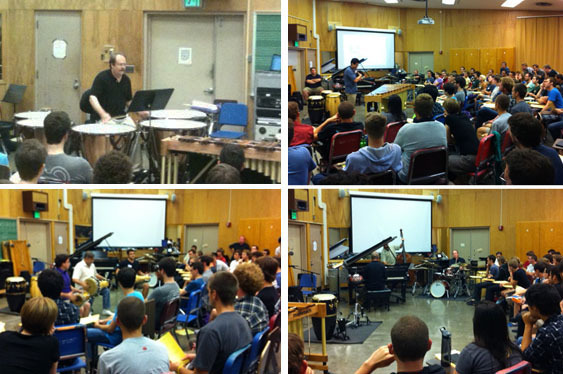 Check out Grover Pro's coverage of the UM Summer Percussion Workshop HERE. Robert Van Sice performs a newly commissioned work by Alejandro ViÃƒÂao entitled Estudio de Frontera. 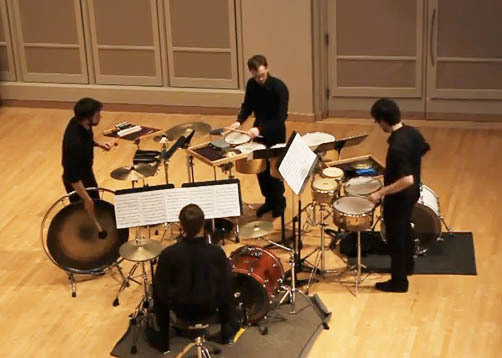 The selections from this performance were from a masterclass at the University of Maryland and include percussionists John Kilkenny, Adam Green, James Swarts and John Biessi. More information about this podcast can be found HERE. 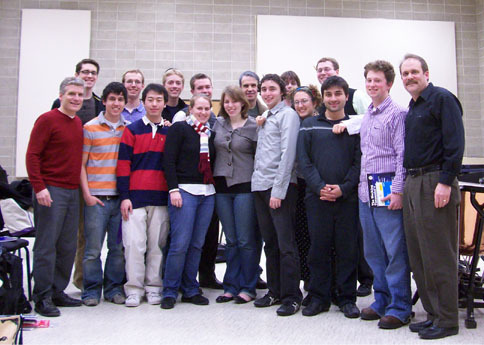 The participants of the 2006 UM Summer Percussion Workshop pose one last time for a photo just before the Grand Finale Concert featuring various percussion ensemble works. More photos of the 2006 UM Summer Percussion Workshop can be viewed HERE. 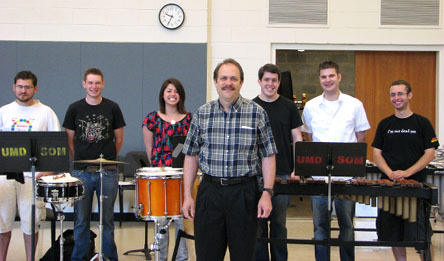 Here are some of our 2006 UM Summer Percussion Workshop faculty. 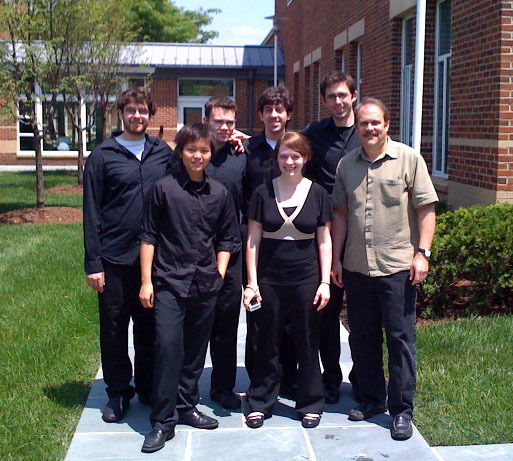 Left to Right: Tom Teasley, Scott Pollard, Adam Green, and Mark Dinitz (Attacca Percussion Group), John Tafoya, Tim Adams, Peter Erskine, Aubrey Adams, She-e Wu, Christopher Deviney, and John Kilkenny. This photo was taken following a faculty recital which took place on Monday, July 24 in the Clarice Smith Center for the Performing Arts. Other faculty for this week included: Tony Ames, Steve Fidyk, Neil Grover, Rebeccca Kite, Talujon, Robert Van Sice, and Greg Zuber. 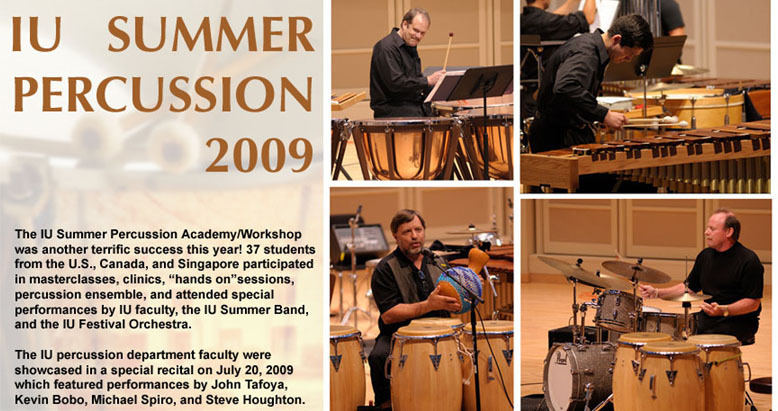 July 23 was the start of the 2006 UM Summer Percussion Workshop. Over 45 participants were treated to drum set clinics (by Fidyk and Erskine) in the afternoon followed by a terrific concert at 7 pm. Here is a photo of my set up (8 drums, including a 16" piccolo for a high F# above middle-C) for Henri Dutilleux's Correspondances for Soprano and Orchestra. I had a a great time working with the talented percussionists at DePaul University on Monday, April 3rd and with the terrific percussionists at Virginia Commonwealth University (Richmond, VA) on April 12th. Special thanks to Grover Pro Percussion, Remo, Zildjian, and Mr. Eric Millstein/DePaul University and Mr. Kristopher S. Keeton/VCU for sponsoring these events! Photos of the tour can be found HERE. Additional photos can be found at Danny Villanueva's site: HERE. 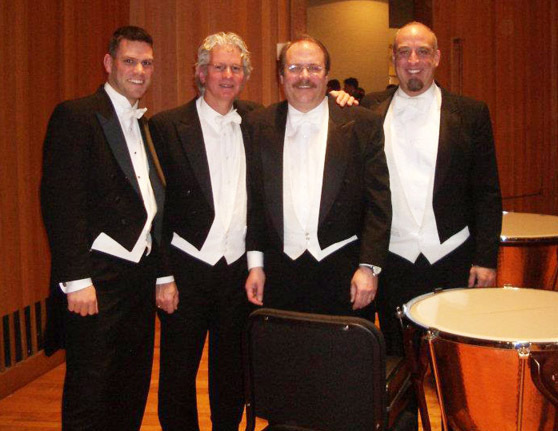 The NSO Percussion section dressed up appropriately while performing Mozart's German Dance No. 3 for a Family concert that was presented at the Kennedy Center on March 12th. Click on the photo if a larger image is desired. J.B. presented a very interesting masterclass using computer software to test how we perform rhythms and to improve sightreading abilities. It was a lot of fun! He also presented a recital that evening (March 13) performing works by Carl Vine, Eric Richards, J.B. Smith, Edmund J. Campion, and Daniel Lentz. 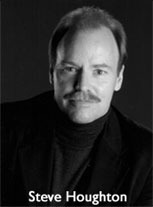 Dr. J.B. Smith is professor of percussion at Arizona State University. Please check out my friend and colleague, Tony Ames' new website at: www.tonyames.com. Tony is principal percussionist with the National Symphony and serves on the percussion faculty at the University of Maryland. Offered in two new Expanded ranges up to F8. Bars: 7/16" x 1 1/4", unique nickel plating that will NEVER flake. Both models come in Fall Creek's extraordinary Resonator Cases. Will tune to suit. More information can be found at: www.marimbas.com/k100.html. Special Thanks to Mr. Ron Barnett! Ron Barnett (previous professor of percussion at the University of Maryland and principal timpanist for the Kennedy Center Opera House Orchestra) presented a terrific masterclass at the University of Maryland on March 3. Mr. Barnett introduced some interesting sightreading techniques and elaborated on important musical concepts to consider when performing auditions. Special Thanks to Mr. Dean Borghesani! Dean Borghesani, principal timpanist with the Milwaukee Symphony Orchestra presented a timpani masterclass on February 17th. In addition to discussing the "audition scene"; offering practical advice on how to succeed at auditions, several UMD students also performed orchestral excerpts. Special Thanks to Mr. Nick Woud! Nick Woud, Solo Timpanist with the Royal Concertgebouw Orchestra, presented a terrific timpani masterclass at the University of Maryland on Monday, February 13. In addition to discussing his concept of sound and technique for the timpani several UMD students performed for Mr. Woud. Mark Latimer, Section Leader and Timpanist for the "President's Own" United States Marine Band, presented a timpani clinic at the University of Maryland on Friday, February 3rd. Mark presented a number of important musical and practical advice and several UMD students performed orchestral timpani excerpts. The Working Timpanist's Survival Guide hits www.amazon.com! Professional Percussion Products NEW website is now online. Check it out at: http://www.professionalpercussionproducts.com. 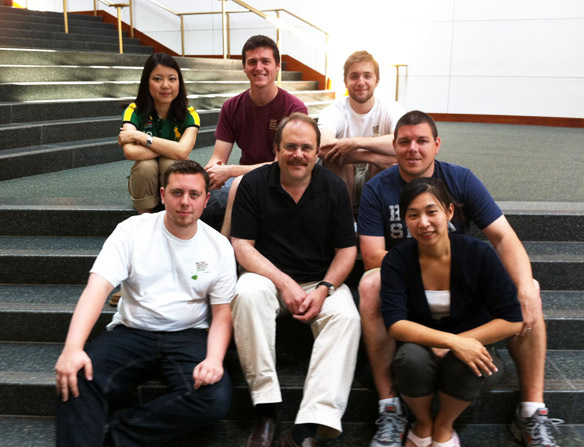 Fred Begun visited the University of Maryland's School of Music on December 2nd. A Timpani "mock" audition took place followed by a discussion of orchestral timpani excerpts. Allison Miller presented a wonderful drum set clinic on Wednesday, November 30, at the University of Maryland's School of Music. SPECIAL THANKS to the Avedis Zildjian Company, Vic Firth, and Yamaha. Ms. Angela Zator Nelson, Associate Principal Timpanist and Percussionist with the Philadelphia Orchestra, presented a terrific masterclass on Monday, November 28 from 3-4:30 pm at the University of Maryland. SPECIAL THANKS to the Avedis Zildjian Company! Students from area youth orchestras performed a special concert, conducted by Maestro Leonard Slatkin, along with NSO musicians on November 18th at the Kennedy Center. More information on this performance can be found HERE. The NSO Youth Fellows will be featured in a recital this evening at the Kennedy Center. Click HERE to see it LIVE (6 pm EST on 11/19/05). Sean recently received a First Place Prize in the University of Maryland's Ulrich Competition in Solo Performance. Sean is currently a DMA student at the University of Maryland; studying with Mr. Tony Ames. A pair of old 28" and 25" Leedy (Indianapolis) timpani. Check them out in my Drums and Sticks section. Ebay is a wonderful thing! Columbus, Ohio, November 2-5. Click HERE for 2005 PASIC Photos! Check out photos my from the tour HERE. You can also check out Danny Villanueva's online photos (Danny is a University of Maryland DMA student who played extra percussion on the NSO tour) HERE. Mr. Buz King, from King Kong Kases, created a TERRIFIC timpani mallet (and timpani tools) trunk which I use for all NSO tours. The trunk model is known as the "Symph Caddy" - check it out: HERE. A few modifications were made to make this trunk "timpani friendly"; including a hinged door and eliminating the cymbal section of the trunk. With this set-up, I am able to store my tools and mallet case easily. Available Mid-September. Only 1000 copies will be made of this commemorative 3-CD collection featuring memorable performances by the Orchestra with each of its 5 music directors: Hans Kindler (1931-1949), Howard Mitchell (1949-1969), Antal Dorati (1970-1977), Mstislav Rostropovich (1977-1994) and current music director Leonard Slatkin. The CD can be ordered online through the Kennedy Center Gift Shop at: www.kennedy-center.org/giftshop/html/categoryDetail.cfm?categ_id=2003092214201318. Click HERE for even more OLD news!